I’ve just received my print copy of Lands of the Nile, the second African “not-Tribunal” book and it’s an absolutely fantastic piece of work, further demonstrating that “the Mythic World” of ArM5 includes much more than just the conventional construct of Europe and adding to the non-Christian extent of the setting. To my mind, these two books have always been one project – in fact when Timothy (Ferguson) originally pitched the idea this material was going to be one book. This was how it was developed and brainstormed, until we realised the only way to do the material justice without compromising the amazing potential of this area was to excise Egypt and the Nile into it’s own book and give ourselves more time to get everything right for players and Storyguides alike. It’s always great to see the interior artwork finally, there’s some really great pieces that capture the flavour of the region – as a line author we get to suggest scenes for the artists but we usually don’t see the actual pictures until the final supplement. (My copies are often delayed compared to most due to my Antipodean residential status). So finally, my fourth book for ArM5 is on its way (December)! I was privileged to contribute some concepts and ideas to the latest opus crafted by Ben, Mark and Timothy. Although we’re all bound by NDA, I can say that this supplement is full of great material and ideas to allow your characters to explore another exotic set of locales or create characters from the lands outside the core heartland of Mythic Europe. If you liked the potential and possibilities of exploring beyond the boundaries of Hermetic influence presented in The Cradle and the Crescent, you’ll likely not be disappointed and find hours of inspiration and enjoyment! Everyone knows Egypt, but Egypt is just one corner of Africa. Between the sand of the Great Desert and the sea of the Mediterranean lie the great cities of Marrakesh and Fes, home to merchants, scholars, and thieves. The Atlas mountains and the plains of the Tell are home to Tuareg and Berber nomads and raiders, and the ruins of Rome and Carthage still await exploration. Not all of the inhabitants of this land are human: the Blemmyae have no heads, bearing their faces on their chests, while the Panotii have ears so large that they can fly, and the isle of monkeys tolerates nothing human on its shores. Trade caravans from all cultures cross the Great Desert, but none know what lies beyond, or where the slaves brought north come from. 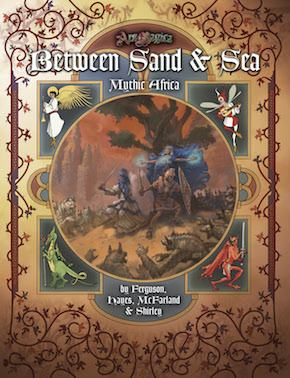 This book provides cultural and magical details for the lands of Mythic Africa west of, but not including, Egypt. From the jnun to the dark gods of old Carthage, from the bustling cities of the Tell to the wind-haunted mountains and deserts, this is a land that will take magi away from the familiar. Whether building a new covenant outside the Tribunals, or visiting in search of magical secrets, there is something for every maga between sand and sea.